Middle Kids inside the World Cafe Performance Studio. Rock's not dead. They say this every few years — or months, or days — but really, the state of rock is quite strong. Look no further than the incredible string of Australian rock bands that have come stateside in the last decade, including Tame Impala, Wolfmother, Courtney Barnett, and today's guest, Middle Kids. Middle Kids is made up of Hannah Joy, Tim Fitz, and Harry Day. The three-piece is based outside Sydney and if the name sounds familiar, it may be because we visited with Middle Kids for our World Cafe Sense of Place Australia Series in 2016, but in 2017 they received a bump from someone who has even more pull than World Cafe — Sir Elton John. (OK, maybe a lot more pull.) He showcased the band's work on his personal radio show, raising their profile dramatically. 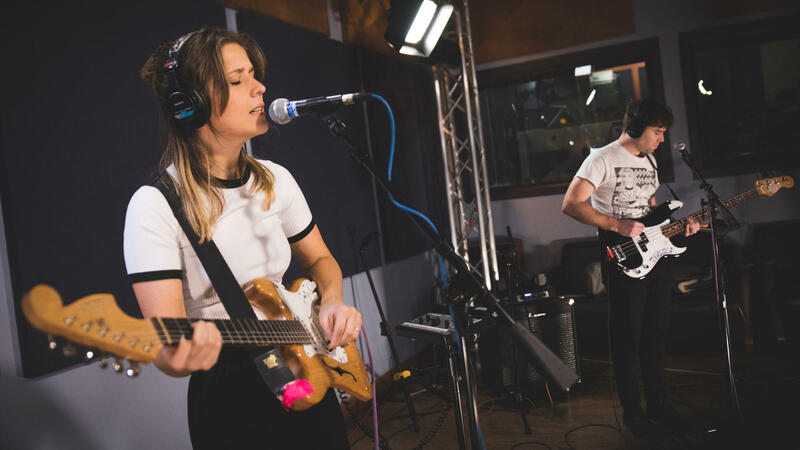 In this session, the members talk about cutting their teeth touring with Cold War Kids and Ryan Adams, and we'll find out who's on the band's Mt. Rushmore of Australian rock, but first, we begin with a live performance of "Mistake." Hear it all in the player.